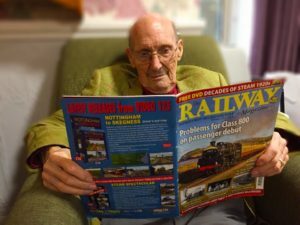 Gerald Bailey, a sage 91-year-old retiree, is sitting in a comfortable armchair in a lounge at Edenmore Nursing Home, reading about trains. More specifically, he is reading about steam trains in a copy of Railway Magazine, which is a journal that currently sells more than 34,000 copies a month and is more popular now than it has ever been. Gerald has been living at Edenmore Nursing Home since November 2017 and when I contacted them in my research to investigate the ways people living in care homes chose to keep occupied, they suggested that I come down and have a chat with him. Gerald lives with dementia, which is a condition that affects almost one in two people once they get over eighty-five-years old, and keeping the brain engaged by reading is an excellent neural exercise that is thought to slow down the rate at which dementia advances. Edenmore always refer to anyone living with them as family members, rather than residents, which I thought was a lovely touch and they offer a wide range of ways for their family members to keep occupied. There are weekly music performances and clubs that can be involved , with visits from local churches so that hymns can be sung, and services heard, flower arranging sessions and games that can be played. When I met Gerald, he was very happy to talk about trains. He told me he used to work for British Railways, the forerunner to British Rail, having joined the Civil Engineers Department at Bristol Temple Meads Station in 1945. When I asked what his job involved, he nodded and adjusted his glasses. Edenmore are always looking for new ways to keep all their family members happily occupied, rather than perhaps dozing because they have nothing else to do. Options on offer can range from games to day trips and from music to art. Unless that is, the family members have their own preferred ways to keep themselves engaged, like Gerald. “It takes me back“ he says, looking at the magazine, “And in those days, you could travel anywhere as most towns had a station, even the small ones. And we had free travel-cards which were one of the perks of the job.” He smiles before looking down at his magazine again. The popularity and benefits of reading cannot be underestimated. The UK’s Reading Agency states that in a poll of four thousand people, readers for pleasure reported fewer feelings of stress and depression than non-readers, and stronger feelings of relaxation from reading than from watching television. Studies have shown that those who read for pleasure have higher levels of self-esteem and a greater ability to cope with difficult situations. Reading for pleasure was also associated with better sleeping patterns. These aspects are of great benefit to anyone living in care such as Gerald. In England, 36% of adults don't read for pleasure, despite the fact that research shows that it can reduce the symptoms of depression and help build relationships with others. Knowing that Ilfracombe lost its station and line in 1970, I ask Gerald what it is like living in Edenmore Nursing Home, which is in a town that is no longer connected to the rail network. He pauses before looking across to me. “I feel like I’m always travelling in First Class, here, ” he smiles, as he settles back into his armchair.